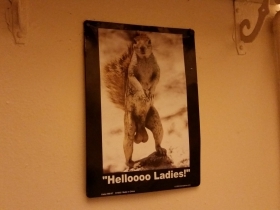 The Squirrel Cage. Photo by Jordan Garcia. If you’re the kind of person who can find the intersection of E. Walworth St. and N. Stanley Pl. without referring to a map, then chances are you also know your way around N. Gordon (Street and Place) and are familiar with the segmented charms of N. Dousman St. If not, you’re going to find yourself completely lost in this tiny sliver of Riverwest just a block east and north of the major intersection of N. Humboldt Blvd. 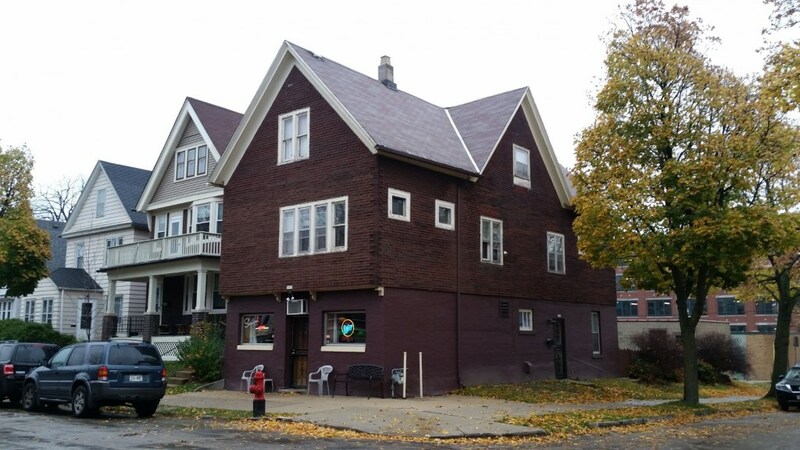 and E. North Ave. Once you gain your bearings, you will find yourself at the door to this tiny tavern in an 1895 building at 2402 N. Dousman St. The Squirrel Cage occupies the 1,078 square foot first floor of the corner building, but don’t let the small size of the bar’s interior surprise you, for only about half of that space is the tavern proper. The remainder is behind a closed door, so you only have about 500 square feet surrounding you. It makes the Eastsider, at 912 square feet, seem positively capacious. Pool table inside the Squirrel Cage. Photo by Jordan Garcia. Despite the limited footprint, the Squirrel Cage manages to squeeze a pool table into the room. You would rather not leave the cue ball on the north side of the table, since the wall is quite close by, and you will have to use a short stick, which is provided. Most of the other cues are plastic, which is the billiards equivalent of the aluminum baseball bat. Worse, actually. 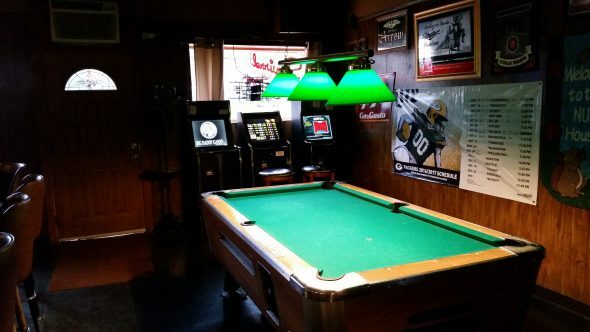 Forget the pool, and head to the bar, which is a shorty stick away from the south end of the pool table. Grab a seat at one of the stools. Oh, you’re thirsty for a tap beer? Then get off your seat and head up the street to The Gig, or Gee Willickers to indulge your tastes. 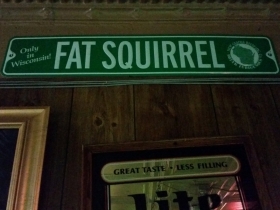 There are no tap beers in the Squirrel Cage, making this a rarity among Milwaukee neighborhood taverns. Instead, take your cues from the old Blatz clock that is on display on the bar. Order a can of Blatz and a shot of brandy, which are commonplace offerings in Milwaukee neighborhood taverns. Take a look at your surroundings, which is easy to do here, and you will note that the place is neat as a pin, and tidy as can be. Somebody’s smoking cigarettes somewhere in the building. The tavern’s namesake critter, the Sciurus carolenensis, is represented in several effigies on a shelf above the back bar, and constitutes the principal decorative element here. Let your eyes wander upward, and you will note the fire-resistant tin ceiling of considerable vintage that testifies to the location’s long use as a tavern. If you study the ceiling with enough vigor, you can see where the ladies room was added decades ago, ignoring the pattern of the tin border. The television will give you a good idea of the latest news in sports. A sheet on the wall tracks the fortunes of the bar’s Fantasy Football league, and a wall-hung digital jukebox is the newest thing in the room. The bar is a survivor, that’s for sure. Back in 1931, with Prohibition still in effect, this was operated by Stanley Smukalla as a licensed “Soft Drink Parlor.” His late descendant Mark Smukalla operated the now-defunct Treats, and for a time operated the now-closed forever “Smokey’s” just north at 2425 N. Dousman St. That soft drink parlor was operated in 1931 by Frank Kurkiewicz. 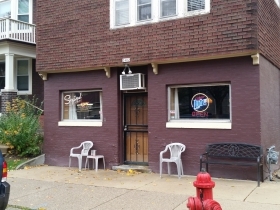 Other soft drink parlors on this short street included one run by Stanley Kwiatkowski at 2479 and Andrew J. Papka at 2578 N. Dousman St., the current Gee Willickers. 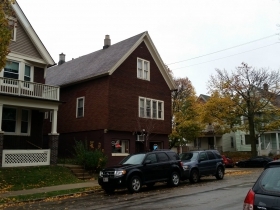 Despite Prohibition, there was plenty to drink in the Riverwest neighborhood, it is clear. The neighborhood has changed over the years, yet there are still plenty of old timers who head to the bar for a quick, or slow, drink. According to the few customer reviews of the place, most of them found it quite by accident. One fellow wrote that he liked it so much he moved in to the apartment upstairs. Another reviewer joked about the $20 cover charge, the full parking lot, the uniformed staff, the rare gins, the imported Sardinian olives and the jacket and tie dress code, none of which you will actually find here. Perhaps he was thinking of La Cage, which is a different sort of cage. Anyway, the Squirrel Cage is certainly a good escape from the Rat Race. You didn’t think I’d resist that line, did you? If you’re hungry, there is a wall of snacks here that rivals that found at the Falcon Bowl, and you can always grab a bag of peanuts. They might come in handy, since the word is out in the squirrel community, and the little critters have been spotted here begging for a snack. Well, we’ve had a nice time here at the old tavern, and it’s time to pay up. Put away your credit card. No, that does not mean I’m paying. This is a cash-only establishment. What? You left your cash at home? I guess this one’s on me. 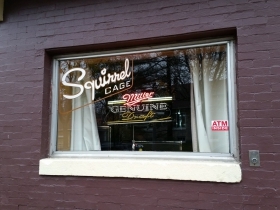 Fun Fact: The Squirrel Cage bar is not far from the home of the late artist Bob Watt [1925-2012]. “The Last of the Bohemians,” an art show in tribute to Watt is being held until December 17th in the Grove Gallery, 832 S. 5th St. It draws from the private collection of Jimmy von Milwaukee, who was a champion and supporter of Watt’s work. Watt was fabled for his ability to transform cheap “Sofa Paintings” into tributes to Native Americans and famous for “laying on a painting” for friends — giving it to them for free. I am among the fortunate recipients, with two paintings on my wall. He also reports that he has sold two of the works, which are priced in the low to mid $1,000 range. This is the first show of Watt’s work since his death, and may help to establish a market for his art. Von Milwaukee also writes that the Museum of Wisconsin Art is expressing an interest in Watt’s art, and that he plans to donate a canvas to the museum in honor of the late photographer Julie Lindemann, who, with her partner John Shimon, were supporters of Watt. Description: Two-story, two-tone brick building. Business downstairs, party (an apartment) upstairs. 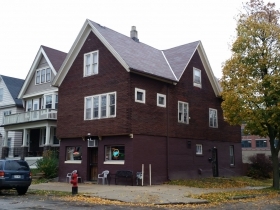 Estimated Annual Rent: 1,078 square foot bar area at $8.82/sq. ft. = $9,507.96 per year according to City Assessor’s calculations. Property is assessed at $13,500 for the 3,600 sq. ft. lot ($3.75/sq. ft.) and $98,500 for the 2,156 sq. ft. building for a total assessed value of $112,000. Business: Tavern. Alcohol and entertainment. I’ve never been to The Squirrel Cage (must go), though I think I do remember a bar called The Nut House in the area where Circa used to be. Also interesting news about Jimmy Von Milwaukee’s reading (I was at the Bob Watt opening). Great reporting as usual, Michael Horne!